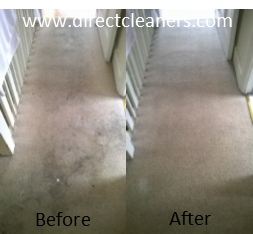 Direct Cleaners Ltd: Can We Clean It? Yes We Can! Here are some great before and after photos of a carpet we cleaned in Raynes Park. This was booked as a repeat client, so we would normally know exactly what to expect from the job. However, on viewing the carpet it looked like something had gone drastically wrong, and certainty not a condition we were expecting! I really wasn’t sure whether it was even worth cleaning, of which I advised the client, however, they were determined that at least we try our best. Ok, we are professional carpet cleaners, and certainly have the knowledge and equipment to at least make a difference, so why not give it a good go. This is what we call in the industry as a salvage clean! We started off by giving the carpet a really good thorough power vacuum with a Sebo 36 vacuum cleaner to remove loose and dry soil. 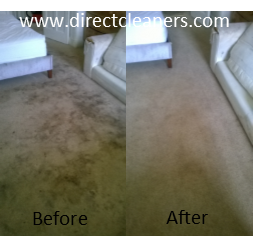 This is an important step in any carpet cleaning process as it can remove around 70-80% of dry soil in the carpet. Does you carpet cleaner do this? We then used one of our more powerful pre-treatments products at quite a high Ph to thoroughly pre-treat all the stains and heavy traffic areas. This was then followed-up by agitating the carpet with a counter-rotating power brush which helps to further breakdown and ‘soften’ the stains and soils and suspending them for easier extraction. Then it is time for the real power… a 50 horse power Blueline, truck mounted machine, using a low Ph rinsing solution (to naturalise the high Ph pre-treatment), VERY hot water and an unbelievable suction to extract all the dirt, stains and soil we have just ‘broken down’. Now, when you go over the carpet with the cleaning wand for the final process, it looks amazing… BUT, you have to remember, it’s not the final machine, rinse and suction that has done the work, it is the pre-treatments and preparation that has REALLY made the carpet come up this well. This is why you have to be careful of ‘cheap’ companies that only use a chemical in the machine to do the job. 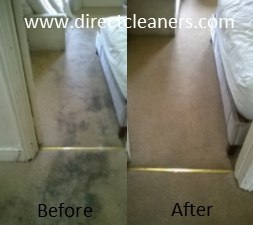 This isn’t really getting the carpet clean, and in a lot of cases is causing damage to your carpet. So, if you are in the South London area and have a carpet cleaning challenge for us, find out if ‘Can We Clean It’ and give us a call on 020 8687 1711 and we’ll come and give you a free consultation with honest, helpful advice and a full written quotation.